The output of the low-priced charging generator AG SL is set by modifying the distance of the electrodes. The AG SL has one high-voltage connection (DC). The output voltage is displayed by means of an analog measuring instrument. 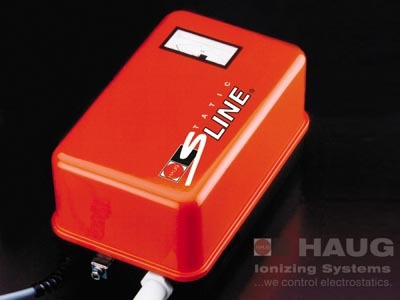 All HAUG charging generators are available with positive or negative polarity. for fixing films and foils on turrent film winders, for fixing the wound film against telescoping and glue-less commencement of the film winding process on cardboard tubes.